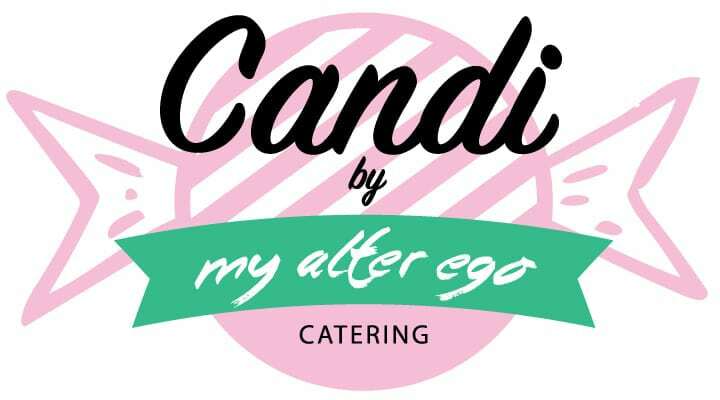 Inspired by all things sweet and good, we’ve launched our latest creation – Candi by My Alter Ego. 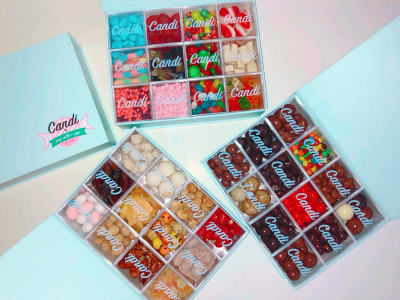 Each beautifully presented with 12 reusable acrylic boxes filled with the type of yummy that gives you those delicious shivers up and down your spine. Each box contains over 1.5 kilos of yummy goodness. The perfect gift for any occasion try someone special to the perfect treat – or better yet… Treat yourself. All about the sweets and the lollies. A straight up sugar hit that will make every other gift pale in comparison at the next party you’re booked in for, or the upcoming anniversary. There is simply no better way to show the sweet love of your life how much you adore them than with the incredibly beautiful-to-look-at and even-better-to-eat Sugar Mama. 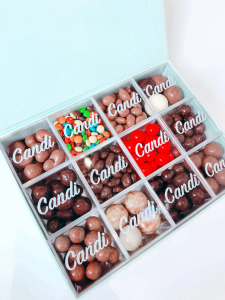 Enjoy the following sweet treats; rock chocolate, raspberries, boiled candy, strawberry and creams, sour worms, cola bottles, toffee apples, milk bottles, nerds, musks, jelly beans and gummy bears. 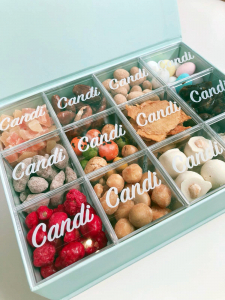 Enjoy the following nutty goodness; dried pineapple and papaya, candied almonds, savoury peanuts, sugared almonds, cinnamon almonds, Japanese peanuts, dried Bowen mango, organic dates, sugared peanuts, honey macadamias, strawberry yogurts and popcorn macadamias. 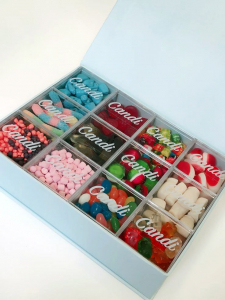 This box won’t be leaving anyone unsatisfied after they wrap their lips around the tasty awesomeness in this big boy! We selected 12 of the finest chocolates we could find, placed them oh-so-delicately into the Choc Blocker box and sealed them with love. No matter how much of a chocolate fiend you are, The Choc Blocker has got you covered! Allergen Warning – Boxes contain items that are processed on equipment or contain peanuts, tree nuts, milk, soy, wheat, egg and sesame seeds. If you or the person receiving our product have allergies or intolerances to any of these products we recommend not purchasing our product.